he childhood of Janis Ian Fink was hardly stable. By the time she was fifteen, she had already lived in thirteen places around the New York City area. High school teachers disliked her, calling her "a disruptive influence." One day, while waiting for a guidance counselor, she felt suddenly moved to write a song that symbolized her youthful frustration. She called it "Society's Child." "It was a good song for the time," she said. "A good song for a fourteen- or fifteen-year-old to write. I don't think the song holds up today as well as it did. I don't sing it anymore." "Society's Child" stirred up a storm of controversy in 1967. Its themes of interracial love and adult hypocrisy caused it to be banned by many radio stations. In Louisiana, one deejay was actually murdered for playing it on the air. The record made Janis an overnight sensation, and, in her own words, "a precocious, snotty kid. I was so serious. My God, I thought I was heavy..."
Her parents' marriage collapsed, and Janis ran off to Philadelphia with a photographer friend. Over the next few years, she turned out a half-dozen albums of stark, unhappy music, which she later called "lousy." At nineteen, confused and numb, she completed a Philharmonic Hall concert, strode off stage, and "dropped out." After two years of psychoanlysis, and numerous ventures into the mystical world of drugs, Janis hit rock bottom. Nearly broke, she seriously considered becoming a secretary, but then decided to give the music business just one more try. After several embarrassing auditions for various labels, she was signed by Columbia in 1972. Her first album for them, Stars, included the lonely blues ballad, "Jesse." Roberta Flack turned it into a Top 30 hit in 1973. 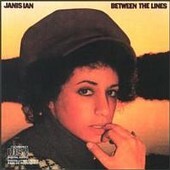 The next Ian album, Between the Lines, featured her long-sought follow-up to "Society's Child." Like that early tune, it was an intropsective recollection of her own romantic and sexual frustration -- "At Seventeen." "I wrote that song at my mother's house," recalled Janis. "I was sitting and reading the New York Times when I came across an article about debutantes and proms. In it was the line 'I learned the truth at seventeen,' or something like that. My guitar was handy, so I started playing around with this little bossa nova riff, the one that opens the song. I finished up the first verse and chorus, and then a couple of days later, the last verse and that chorus. The middle part came two weeks after that. "I think 'At Seventeen' is a good song. It does what a good song should do, which is strike a nerve, communicate to any age group, cross class and cultural boundaries. The problem with protest stuff like 'Society's Child' is that I was singing to people who felt the same way I did. I wasn't changing anybody, or making any difference to the people. I think 'At Seventeen' may make some difference to some kid in junior high. A lot of people seemed to relate to it, anyway." "At Seventeen" broke onto the charts in mid-June 1975, and peaked in September. In total, it spent nearly five months on the best-seller lists. "It seems like a good thing to be able to say, 'I wrote a song everyone can believe,'" said Janis. "I started out wanting to be a star. I guess everyone begins that way. I wanted to be Baez, or Odetta, so I sang. But I love songwriting best. That's what I'd like to be when I grow up. A songwriter." Janis' Between the Lines would go on to reach platinum status in 1975, but her succeeding albums were less popular. Following a 12-year hiatus from recording when she undertook a study of acting, Ian -- having revealed her homosexuality -- returned to the music scene in 1992 with Breaking Silence, a subdued, folkish album whose straightforward songs tackled such subjects as battered wives, eroticism, concentration camps, and sixties nostalgia. More recently, she released Revenge, a harder-edged album produced by Mary Chapin Carpenter's producer John Jennings. Janis relocated to Nashville in 1986, where she says there is "a sense of community that I haven't seen since Greenwich Village in the mid-sixties." One result of teaming up with several Nashville writers was a catalog of more than 60 songs, a number of which have been embraced by other artists, including Bette Midler, Amy Grant, John Cougar Mellencamp, and Hugh Masekela, among others. She currently lives there with her partner Pat and their two dogs.